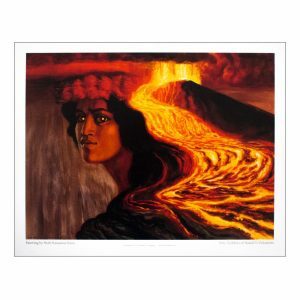 In Hawaiian myth Pele is a powerful Fire Goddess. She is also the Goddess of lightning, wind, volcanos and the Creator of the Hawaiian Islands. Her sacred name is “She who shapes the sacred land.” Pele being a Hawaiian goddess also governs the volcano Kilauea and is in control of its lava flow. As we have all seen and felt lately pele is a force to be reckoned with, as her ferocious energy comes to the surface looking for an outlet. The Goddess Pele’ is a molten earthy mirror that reflects our own internal fires that swell out of control. One can only stuff so many angers and injustices without the very blood of the earth beginning to boil. We all inherently have the ability to become fire goddesses and explode at will, not caring about the outcome or who we hurt. These lava bracelets come to give us a ‘healing time out’ by embracing our molten nature and the very nature of the earthen female. We tend to stuff what upsets us deep inside, not to be seen, not to be felt. As we can see that does not work very well for the ‘Goddess Pele’. Lava is all about inner earth, inner truth, inner healing. Lava rock is the oldest stone in the world. It literally comes from the Core of The Earth. Lava is formed when magma erupts from a volcano. It is fiery brimstone that bubbles to the surface, and then cools becoming porous, black and powerful. Lava is a grounding stone and can help you connect with nature and help with her healing, as well as yours. Since the stone comes from raw energy, Lava rock is a stone of rebirth helping to shed unneeded layers of emotional baggage and weight. all of the emotions you have swallowed in the past now choose to be released, why weight/wait any longer? You have eaten your words and fasten your lips shut for eons of time, let it go! Lava is known for its grounding qualities and for calming fiery emotions. Since it comes from raw earthen energy Lava stones are fantastic for healing the root chakra which deals with fears, survival issues, past life issues and death. A strong connection from earth to inner earth is created with these stones allowing you entrance into what has been hidden in plain sight. Lava stones are recommended to be worn close to the skin, if not directly on the skin. It is important the barrier for absorption is not blocked. This allows the energy to flow freely and clearly keeping energies balanced. Lava stones were used by American Indians when entering battle for the qualities of strength and clarity. In folk remedies, it was given to soldiers to help them remain calm during battle. These lava rock bracelets are from the Guadalupe Island volcano. The island is located 160 miles west of Baja California. The volcano is very deep seated. Lava is a stone of protection and cleansing and will help you stay clear of people who have a bad influence on you. Uniquely designed and crafted, these bracelets are made of Natural Volcanic Lava Rock beads known as Basalt. Basalt is formed from molten lava and molten lava is heated liquid rock you can imagine the strength, fire, and power contained within these Inner Earth bracelets. When we heal thru inner earth we heal ourselves and Earth. ***This bracelet is perfect to be used as an infuser. The volcanic basalt rock absorbs any scent or healing oil you place on it, holding that spirit for several days. Lava rock affirmation: I let my angers of the past burn away the emotional dross and create new opportunities for Healing, Love and Prosperity. This entry was posted in Uncategorized and tagged boiling blood of the earth, Fire Goddess, lava is stone of rebirth, love, Pele, Quantum Awakening. Bookmark the permalink.